Inside there was a mural at the top wrapping around the theater telling the Cinderella story in 8 paintings. Jerry H My brother and I were there that day and we were also on the fire escape stairs. J giles band was playing. Butch Z was my brothers name. We lived on lakeview one street over. The Cinderella is part of our childhood and will never forget it. I was at the Cinderella April 22, 1972. Me and a friend were able to get the fire dooors opened on the eastside of the building at the top of the stairs and were charging half price. I'm sure j. giles and Peter wolf remember it for other reason, but I'm sure the were made aware of what we did. I use to live on eastlawn in the1963 till 1970. me & my brother went this show almost. afew times amonth on saturdays. our father drop us off at the door. it was so kool 2movies &cartoon 50cents. Popcorn. 25 cents. Pop 15. cents. My recollection is the Cinderella closing in 1971 not 1975. I remember the fare on my last two visits: Sam Pekinpah's The Wild Bunch, and the adaptation of John Updike's breakthrough novel, Rabbit Run, starring James Caan and Carrie Snodgress. (whatever happened to the lady?) The second level was already being dismantled. There were boxes and boxes of reel cannisters spilling out of the storerooms. Eschucheons and decorative cornices had been ripped from the walls. Perhaps the palace did undergo one more resurrection, but I for one never returned. Too many memories being desecrated and trashed. I remember going to the Cinderella when i was around 6 or7 years old with my older sister melody and my brother Theo and sitting in the 1st row up close and eating candy i found off the theater floor,but i can't remember what movie was playing,but i think the candy was red hots?. My parents owned or ran it during the 1971 & 1972 concerts. I remember running up and down the staircases as a kid. Wasn''t allowed to go during the nighttime concerts, only during the daytime. I have a china set that my grandmother said she collected over the years while visiting a movie theater. I later ran into another fellow detroiter that had the same china set as I did and said it came from the Cinderella Theater. Does anyone have any more info about the theater giving out china? Thanks. The Cinderella was owned and operated by UDT (United Detroit Theates) during the 50''s, until 1961, they closed it and it was taken over by Bill Brown & Norman Cohen, parters in the Fox Theatre operation. Norn Cohen , was the producer of (I was a Teenage Werewolf) and several other 5o''s SiFi Hits. They ran the Cindy until 1967 or 68. Paul Widdis was one of, maybe the last Manager''s of the C indy. When I was young I found a box of reel to reel movies in our house, my mom said they were from the Cinderella theater which my grandfather owned when she was a teenager. His name was John Brioc. That would have been in the 1940''s and possibly early 1950''s. She said he owned the whole block and had a barber shop in that area. As the Cinderella Ballroom theatre, it was a rock and roll palace in the late 60s early 70s. The J. Geils Band recorded their first live album FULL HOUSE there. Designed by Christian W. Brandt, the nearly 1900-seat Cinderella on the East Side of Detroit was one of the larger of the city's neighborhood houses. Built in Spanish Colonial style, the Cinderella made for an impressive sight in its early years along East Jefferson Avenue with its white terra-cotta facade and red Spanish-tile roofing. The theater contained a Mighty Wurlitzer organ which was removed from the Cinderella in 1966. It is now housed in the Music House Museum, near Traverse City. 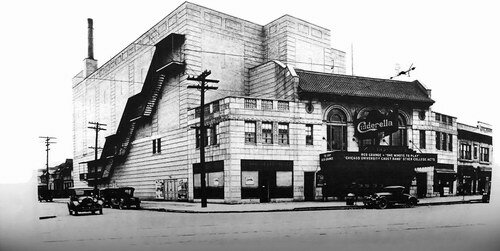 Once host to both vaudeville and movies, the Cinderella was built for J. N. Robinson and opened in 1924. 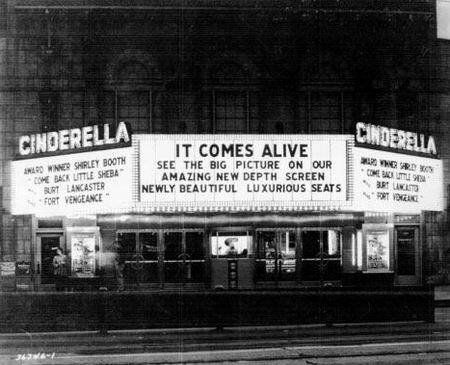 In 1953 it was sold to United Detroit Theatres, which modernized the Cinderella, replacing the seating and installing new projection equipment. After the 1950 Walt Disney film Cinderella came out, the side walls of the theater were painted with scenes from that movie. The Cinderella was closed in the mid 70s, and was demolished just a few years later. Cinema Treasures Link.